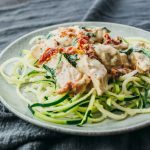 Chicken strips coated in a thick and rich creamy sauce with sun-dried tomatoes and spinach. Slice each chicken breast in half horizontally to make them thinner. Pat dry with paper towels. Combine all seasoning ingredients in a small bowl and stir until well-mixed. Evenly spread the seasoning over both sides of every chicken piece. Select the sauté mode on the pressure cooker for medium heat. When it has reached temperature, add the seasoned chicken pieces to the pot, arranging them in a single layer if possible. Sauté until the chicken is lightly browned on both sides, about 2 minutes per side. Turn off the sauté mode. Add water to the pot. Lift up each chicken piece as you scrape up any brown bits stuck to the bottom of the pot. Check that the chicken pieces are evenly distributed, and that there is enough water to cover the bottom of the pot (if not, add water to cover). Secure and seal the lid. Cook for 3 minutes at high pressure. As soon as it’s done, manually release pressure by gradually turning the release knob to its venting position. Uncover and transfer the chicken to a plate, leaving the liquid in the pot. Discard half of the liquid, about 1/3 cup, so that the remaining liquid only barely covers the bottom of the pot. Select the sauté mode for medium heat. Add heavy cream and cream cheese, stirring until the cheese has melted. Let the sauce simmer for a few minutes until thickened, stirring occasionally. While simmering, cut the chicken into strips. Turn off the saute mode. Add sun-dried tomatoes, spinach, and parmesan cheese to the pot, stirring them in for a few seconds. Transfer the chicken pieces back to the pot, stirring so they soak up the sauce. Serve while hot, optionally with a side of vegetables.